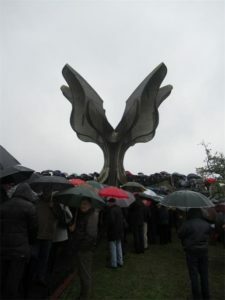 The Jewish community of Croatia organized a commemoration in Jasenovac, the main concentration camp in Croatia, for Jewish, Serbian, Roma and Croatian anti-Fascist victims who were murdered in the camp during the WWII. About 80,000 people perished at Jasenovac. The commemoration was attended by many of the relatives of the victims as well as others. This commemoration was organized separately from the official Governmental ceremonies as a protest to recent developments in Croatia. 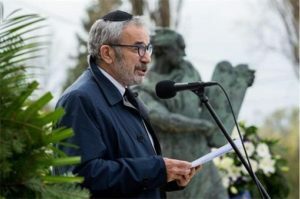 The President of the Jewish communities in Croatia, Dr. Ognjen Kraus, in his speech, clearly accused the government and official structure for the rehabilitation of Fascist criminals, the increasing use of the Fascist salute and Nazi symbols, the rewriting of history, the diminishing of the number of victims, the official commemoration in Bleiburg for Nazi soldiers, the placing in the Jasenovac camp of the plaque bearing the Ustasha salute and other events and incidents in Croatia.